The C-Notes Of Cincinnati, singing quintet, are to appear Monday at 8:30 p.m. over CBS on Arthur Godfrey's Talent Scouts, according to Wes Lay, leader of the group. 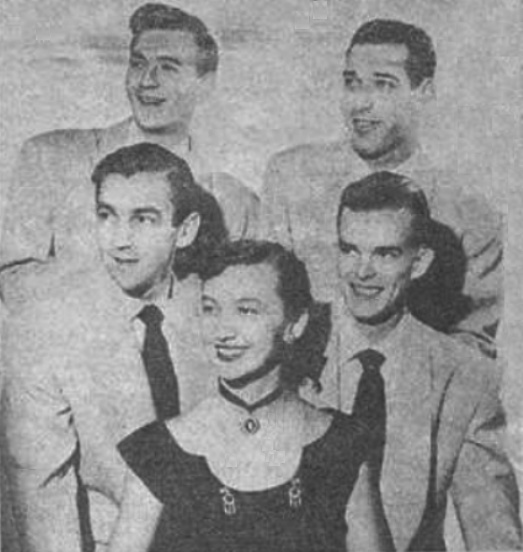 Wes, former member of Ralph Flanagan's "Singing Winds" and Johnny Ziegler's "Varsitones," is bottom right in the picture, the young man above him being Mort Hillman. The other two men are Ronnie Irwin and Charlie Hiller. Jane Griffis is the girl.